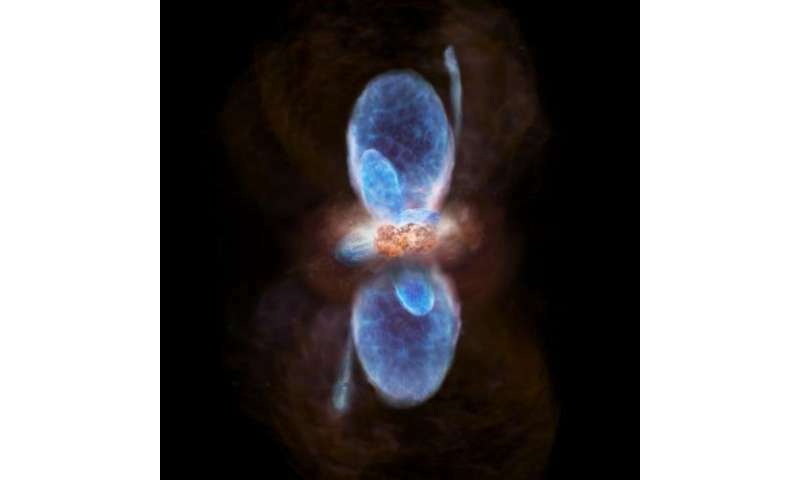 A research group led by Aya Higuchi, a researcher at Ibaraki University, conducted observations of the massive-star forming region IRAS 16547-4247 with the Atacama Large Millimeter/submillimeter Array (ALMA). The observation results shows the presence of multiple, or at least two, gas outflows from a protostar, indicating the possible existence of two new-born stars in this region. Also, the radio observation results of molecular line emission of methanol revealed in vivid detail an hourglass structure created by gas outflows spreading outward while thrusting the ambient gas cloud away. It is the first time that such an hourglass structure was found in observations of methanol in high-mass star forming regions. Detailed observations of high-mass stars have been considered difficult so far because high-mass stars form in a complex environment with multiple protostars in clusters, and their forming regions are located farther away from the Earth compared to those of low-mass stars. However, high angular resolution observations with ALMA opened a new window to understand their formation environment in further details. All stars that twinkle in the night sky vary in their masses. While some stars have masses smaller than 1/10 of solar masses, others have masses larger than 100 solar masses. How such a wide variety of stars are born and what factors make the difference in their masses; these are the most fundamental and most enigmatic astronomical questions which have yet to be answered. To solve these mysteries, it is essential to make detailed observations of various stars of different masses during formation. The formation process of high-mass stars which have masses larger than 10 times solar mass still has much to be explored. Detailed observations of high-mass stars at an early stage of formation are difficult because the number of high-mass stars is smaller than that of one-solar-mass stars and the evolution process of high-mass stars is faster than low-mass stars. Another adverse condition in the study of high-mass stars is the distance from the Earth; while the forming regions of low-mass stars are about 500 light years away from the Earth, those of high-mass stars are farther and even the closest one in the Orion Nebula is about 1500 light years away. Since it is thought that high-mass stars are born in clusters far away from the Earth, it is impossible to understand their formation process in detail without high angular resolution observations. In this regard, ALMA is the most desirable telescope for this purpose as being capable of observing gas and dust which will be ingredients of stars at high sensitivity and high resolution. The research team led by Aya Higuchi at Ibaraki University made observations of the luminous infrared source IRAS 16547-4247 in the direction of the Scorpion. IRAS 16547-4247 is an object emitting strong radiation with about 60 times solar luminosity and being surrounded by high-density molecular cloud with a mass of 1300 times solar mass in a distance of 9500 light years away from the Earth. Past radio observations of molecular carbon monoxide (CO) in this region revealed a pair of outflows which was thought to be emitted from a young star, and some other radio sources have been found in addition to a bright object at the center. "Even though many of the astronomers assumed that this would be a fertile high-mass star forming region, we couldn't probe the kinematics of gas around high-mass protostars at the level of resolution provided by existing telescopes," Higuchi said. To study the structure and kinematics of gas around IRAS 16547-4247, the research group observed molecular line emission of dust, CO, and methanol (CH3OH). From the observation results of dust, it was first found that the center of the region contains two high-density compact gas clouds with masses 10 to 20 times solar mass. It is thought that these gas clouds are surrounding a newly forming high-mass star like a cocoon. And the observation results of CO indicates that the outflows which looked like a blurred object extending in the north-south direction was actually two pairs of outflows aligned with the north-south and east-west direction respectively. Since the angular resolution provided by ALMA was 36 times higher than that applied to the past CO observations, the observation results clearly revealed the details of complex structure and kinematics of gas. 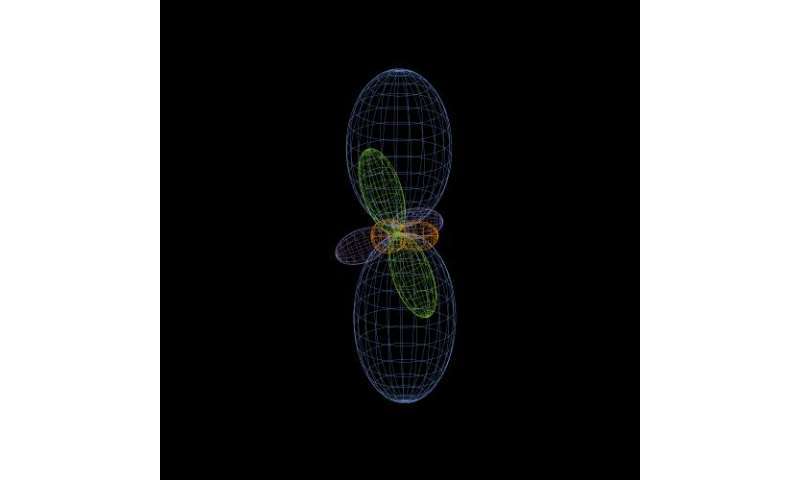 As it is assumed that one protostar is able to produce only a pair of outflows, these results suggests that multiple stars are being formed simultaneously in this region. On top of these, the research group discovered that methanol molecule is spreading from the center of IRAS1654-4247 in the form of hourglass structure. CH3OH is normally produced on the surface of dust, but when the temperature increases by some process, it will be released from the dust surface and turn into gas which emits radio waves. Since the hourglass structure made by the distribution of CH3OH traces the contour of the observed CO outflow, CH3OH is assumed to have been produced by the interaction with the ambient gas which was pushed away by the outflow from the protostar, resulting in the increase of temperature and consequent transition into gas. This kind of hourglass structure has often been found around low-mass protostars, but it was the first time that the distribution of CH3OH with this structure was found in a high-mass-star forming region. Furthermore, past observation results indicates the presence of a maser source emitting extremely strong radio waves on the extended line of the CO outflow. Although it was unknown what is responsible for the maser source in this object, the observation results this time suggests that the maser source is excited by the shock influence between a high-velocity outflow and the ambient gas. "We conducted radio observations of carbon monoxide and methanol to explore the details of the distribution and kinematics of gas in the region where high-mass stars are forming in clusters," Higuchi said. "A typical example of a high-mass star forming region is the Orion Nebula, but ALMA enabled us to see the complex formation environment of star clusters which is even 7 times farther away than the Orion Nebula with the highest imaging resolution ever achieved. ALMA will become indispensable for the future research on the high-mass star forming region."